The 1946 US decision to grant the Philippines its independence inaugurated a period of prosperity in the country. For a number of geo-strategic reasons, in the wake of the Second World War the Americans were willing to let the Philippine government pursue policies that they ruled out elsewhere. The Philippine government was allowed to implement independent policies that fostered the country’s economic development. However, American tolerance was short-lived. From 1962 onwards, and with the backing of the IMF and the World Bank, the Conservatives (who had won a majority of seats in the Philippine Congress in the 1959 elections) imposed radically different policies. These new policies sparked massive capital flight, crippling debts, devaluation, and a drop in wages for the population. It was in this context of crisis that Ferdinand Marcos declared martial law in 1972. The dictator earned the admiration of the World Bank for pursuing policies very much in line with Washington’s expectations. Massive corruption increased popular discontent and brought about the downfall of Ferdinand Marcos and his replacement by Corazon Aquino in 1986. Aquino was the leader of the democratic opposition but was also closely connected to the plantation owners. She carried out intransigently neoliberal economic policies bearing the unmistakable imprint of the World Bank. To be sure, this was a great disappointment to the people. The Philippines remained a Spanish colony until 1898, when Spain was defeated in a war declared by the United States. The US then occupied the country itself; this occupation was interrupted by the Japanese occupation during the Second World War. In 1946, the US granted the Philippines independence in exchange for its acceptance of a number of conditions: a fixed exchange rate between the Philippine peso and the American dollar to protect US companies against the effects of devaluation; free- trade agreements, and so forth. At the beginning, the arrangement worked relatively well since the US was bringing in a large amount of dollars to the Philippines, primarily through its strong military presence in the country. However, in 1949 the flow of dollars slowed down dramatically. The Philippine government established strict exchange controls to avoid a heavy drain on the currency. Private companies were forbidden to borrow money from foreign investors. The US government and the IMF tolerated this measure in order to stay on good terms with their Philippine ally. The introduction of controls over currency exchange, capital flows and imports sparked an economic boom in the country, driven in particular by the growth of industry. This period of economic growth ended twelve years later, in 1962, when the control measures were abandoned under pressure from the United States, the IMF and the World Bank. During the 1950s, the manufacturing sector grew annually from 10 to 12%, the annual inflation rate was kept below 2%, foreign-exchange reserves were strong and the external debt was extremely low. However, this was not to everyone’s liking; American and other foreign companies complained about having to reinvest all their profits in the country’s economy. Capitalist export firms were forced to deposit their hard-currency export earnings in the Central Bank, which returned them in pesos at an unfavorable rate. This was a source of enormous revenue for the state. In 1954, bolstered by its success, the Philippine government demanded that the US alter the rules of the game laid down in 1946 at the time of independence. Washington submitted to this demand, which strengthened the position of the Philippine authorities. Of course, one has to be careful not to idealize the achievements of the Philippines in this period. It remained a profoundly unequal capitalist society, and industrialization did not go much beyond assembly and light manufacturing. Nevertheless, the situation of the 1950s was certainly promising in comparison with all that has transpired since 1962. Indeed, it was these promising developments that triggered the united offensive led by the US, the IMF and the World Bank — together with the most conservative sectors of the Philippine ruling classes — aimed at putting an end to the experience. In 1962, the Conservatives, who had won a majority in the Philippine Congress after the elections of 1959, eliminated controls on capital movements. The IMF and the US government showed their approval by immediately granting a loan of 300 million dollars. The elimination of controls led to massive capital flight towards foreign countries; the resulting deficit was financed by one set of external loans after another. The external debt increased sevenfold between 1962 and 1969 — from 275 million to 1.88 billion dollars! Transnational corporations and Philippine exporters of agricultural products and raw materials rejoiced as their profits jumped. On the other hand, the manufacturing sector oriented toward the domestic market rapidly declined. In 1970, the peso had to be sharply devalued. The incomes and earnings of small producers slumped. It was in this context of a crisis of the policies supported by the United States, the IMF, the World Bank and the Conservatives, that Ferdinand Marcos set up a dictatorship in 1972. His objective was to consolidate neoliberal policies through force. One year later, on the other side of the Pacific, Augusto Pinochet took power in Chile with exactly the same objectives, the same overlords and the same backing! The first loans granted by the World Bank to the Philippines date back to 1958. But the loans remained extremely low until McNamara became World Bank president in 1968. McNamara argued that the Philippines — where there were American military bases, as in Indonesia and Turkey — was of such strategic importance that it was absolutely necessary to strengthen its ties to the World Bank. Lending money was a way to get greater leverage. World Bank historians do not mince words: “McNamara and his staff were annoyed at the way the Philippines legislature was stalemating policy reforms. Thus the Philippines was an instance in which martial law triggered the takeoff of Banking lending. Marcos dismissed the legislature and started ruling by presidential decree in August 1972. McNamara and the Bank staff welcomed the move” |1|. One of the first measures taken by the Marcos dictatorship was the removal of the ceiling on public indebtedness, initially established by the Philippine Parliament in 1970. The regulation had established a debt margin of one billion dollars with an annual ceiling of 250 million dollars. Marcos put an end to this limitation, to the great satisfaction of the World Bank |2|. McNamara announced that the World Bank was ready to at least double the amounts granted |3|. At the time it was too late to increase the loans granted for 1973, much to McNamara’s displeasure. That is why the Bank did the job in double quick time and increased by 5.5 times the total amount for 1974 (165 million instead of 30 |4|). The World Bank and the IMF publicly supported the dictatorship to such an extent that they held their 1976 annual general meeting in Manila. That year, Bernard Bell, Vice President of the Bank for East Asia and Pacific Region, declared: “The risk in lending to the Philippines was lower than for Malaysia or Korea” |5|. It is also worth noting that the World Bank established one of the three centres of research on the green revolution in the Philippines, in partnership with the Ford and Rockefeller Foundations. However, Ferdinand Marcos did not quite carry out the economic policy the Bank had hoped for. The World Bank was disappointed since it was on very good terms with the dictator and the team of academics he had gathered around himself — some of whom became later officials of the Bank, such as Gerardo Sicat, Secretary for Planning and then President of the Philippines National Bank, the main bank of the country. The World Bank did not criticize in the slightest the regime’s repressive measures. However, it was concerned about the slowness with which structural reforms were being implemented. It wanted the dictatorship to replace what remained of the import-substitution industrialization model with the export-oriented industrialization model that it championed. In order to exert greater influence on the Filipino government, the Bank decided to grant two huge structural-adjustment loans in 1981 and 1983, aimed at export-promotion. The Bank was perfectly aware of the fact that most of these funds ended up in the bank accounts of Marcos and his generals; nevertheless, it considered it worthwhile to pay off members of the ruling clique in exchange for an acceleration of the neoliberal counter-reform. At this juncture, in 1981, a banking crisis broke out in the Philippines due to a huge case of corruption involving the capitalists and sections of the state bureaucracy. The crisis spread gradually to the whole financial system, threatening the two largest public banks with bankruptcy. The crisis spread from 1981 to 1983-1984 and was exacerbated by the external debt crisis that broke out internationally in 1982. Foreign private banks stopped granting credits to the Philippines. This was a clear failure for the World Bank and its good friends, Ferdinand Marcos, Gerardo Sicat and Prime Minister Cesar Virata. Popular discontent rose sharply. A number of key sectors of the ruling classes clashed with the Marcos regime. The crisis deepened following the murder of one of the members of the landed oligarchy opposed to Marcos: Senator Benigno Aquino, previously exiled to the United Sates, was shot down at Manila airport upon his return to the country in August 1983. In spite of the growing opposition to Marcos, the World Bank opted to stand behind the dictator. Departing from its plans, it massively boosted its loans to the Philippines: 600 million dollars in 1983, or more than double the previous year’s loans of 251 million dollars. World Bank historians write that it was a matter of loyalty towards a good friend |6|. 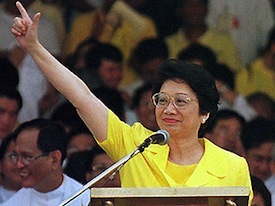 — who supported the Marcos regime until the end and then forced him into exile |8|.Corazon Aquino — leader of the opposition among middle-class and landed sectors and widow of Benigno Aquino — took over the reins of power in 1986. The World Bank then hesitated over which course to follow. The World Bank President for East Asia and Pacific Region, Attila Karaosmanoglu (see the chapter on Turkey), wrote a rather unenthusiastic internal note on the new democratic regime: “We expect that the decision making process will be more difficult than in the past, because of a more collegial nature of the new team, the enhanced role of the legislative branch and the populist tendencies of the new government” |9|. Finally the World Bank, the IMF and the US sought to make the best of the situation by backing president Corazon Aquino since she had made a commitment to keep her country on the right side and even to deepen the neoliberal reforms. The World Bank lent 300 million dollars in 1987 and 200 million in 1988: it was all about greasing the wheels of the privatization of state-owned firms. Between 1989 and 1992, the World Bank lent the Philippines 1.3 billion dollars to finance structural adjustment. The US threatened to block these loans in the event that the Philippines carried out its plan to close American military bases on its territory. As for the land reform demanded by the powerful popular movement that led to the overthrow of Marcos and became even stronger in 1987, Corazon Aquino sided with the landed oligarchy she came from. Between 1986 and 1990, the state only acquired 122 hectares |10|! All told, the government of Corazon Aquino went even further than Marcos as far as the implementation of neoliberal policy prescriptions was concerned. This was cause for great satisfaction at the World Bank. |1| D. Kapur, J. Lewis, R. Webb, 1997, The World Bank, Its First Half Century, Brookings Institution Press, Washington, D.C., Volume 1, p. 558. |2| See Cheryl Payer, 1991, Lent and Lost. Foreign Credit and Third World Development, Zed Books, London, p. 82. |3| The World Bank historians made public one of the internal reports of a high rank meeting between McNamara and his fellow workers: “A rather surprising meeting ! No more of the criticism of early years (politics, corruption, income inequality), but a rather general feeling that we should increase our lending program. And a flabbergasted Area Department trying to defend the cautious position taken in the Country Program Paper (CPP)! The order of the day is to work within the system. (Politics not necessarily worse than in Thailand but more publicized. )… We should aim to lend on average $120 million a year in FY74-78, 50% more than proposed. (World Bank, “Notes on the Philippines Country Program Review, July 28, 1972,” prepared by H. Schulmann on August 15, 1972, quoted by D. Kapur, J. Lewis, R. Webb, 1997, vol. 1., p. 303) (…) “A miracle has occurred in the Philippines. Philosophically, it is distressing, however, that the miracle occurred under the auspices of a military dictatorship. Mr. Cargill said he didn’t believe the miracle would continue, ‘but while it does,’ interjected Mr McNamara, ‘and only as long as it does, let us continue to support it.’” Memorandum, Alexis E. Lachman to John Adler, December 27, 1973, with attachment, “Philippines Country Program Review, December 19, 1973, quoted by D. Kapur, J. Lewis, R. Webb, 1997, vol. 1., p. 304). |4| In 1980, the World Bank lent 400 million. |5| Quoted by D. Kapur, J. Lewis, R. Webb, 1997, vol. 1., p. 304. |6| D. Kapur, J. Lewis, R. Webb, 1997, vol. 1., p.563. |7| Paul Wolfowitz became president of the World Bank in 2005. |8| F. Marcos was transferred to Honolulu by the US Army and lived there until 1989. |9| Quoted by D. Kapur, J. Lewis, R. Webb, 1997, vol. 1, note 102 p. 565. |10| In 1987, a team of the World Bank led by Martin Karcher faced the possibility of a radical land reform, similar to the ones carried out in Japan, South Korea and Taiwan after Second World War, as a consequence of the radicalization of the rural workers struggle. The document delivered by this team in March 1987 recommended the limitation of land property to seven hectares, which implied directly taking on the main growers of sugar cane (namely Corazon Aquino). This study by the World Bank suggested that the landless workers should obtain the lands in exchange for a one-time payment of 600 pesos (around 30 dollars at the time). Needless to say, the study was never followed by concrete measures.